O.K., I’m going to attempt to state my favorite flight simulator here, without this turning into a free-for-all over which one is best, X-Plane or Microsoft Flight Simulator. Debating that kind of thing is a waste of time, sort of like the age-old debates that continue to rage over Apple vs. Windows, Ford vs. Chevy, Target vs. Wal*Mart, Piper vs. Cessna. Or, a new one to add to the mix: Eclipse vs. Adam vs. Cessna Mustang vs. Embraer Phenom 300. Best to let that dog sleep. But on the subject of sims, I love X-plane. Mostly because as a Mac user, developer Austin Meyers has always crafted his unbelievable sim first for the Mac (it’s actually designed in OS X) and then ports it over to run on Windows. For quite some time, the bash on X-Plane was poor graphics. The latest versions feature far greater detail and are very pretty, but reviewers still give the nod to MSFS…at least on eye candy. But if eye candy is your #1 reason for choosing a sim, you’re a gamer and not an aviator. 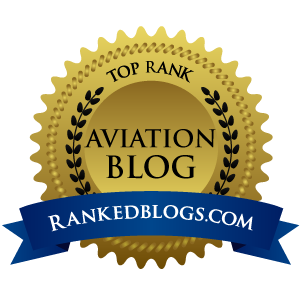 Gamers like bells and whistles, flyers like realism, and in that arena, a long list of reviewers – including me – say that X-Plane wins every time. Meyers, an aeronautical engineer, originally developed X-Plane to test new wing designs. 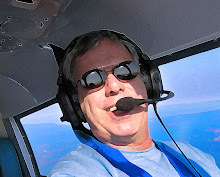 From the data I have read, the program calculates the air flow over the airframe many times faster and with more precision that any other consumer sim out there. I also like the fact that you can tweak it to your heart’s content. 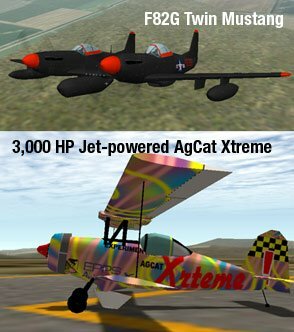 My 4,000 HP DC-3 (2,000 turboshaft BHP x 2 sides) flies like a big phat Lancair, and my jet-powered Agcat Xtreme (photo above) is just plain crazy. You can download an endless number of exotic aircraft such as a TWIN MUSTANG! Until this morning, I didn't even know such a thing existed, now I can go fly all day for free. In fact, those who tell you X-Plane is a game will be far off the mark. The FAA has approved the software for use in Modus full-motion simulators ($150,000+) for training towards your IFR, Comm or ATP ticket. This folks, is the actual, very same, identical program you can buy for US$59.